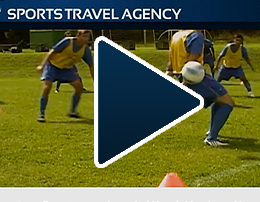 "Sports Travel Agency does an incredible job! The facilities (hotel, training fields and game fields) were great. The organization was excellent, the hotel staff was very accommodating and the meals provided were fantastic. There was the right mix of soccer and sight-seeing, and the level of competition in our three games was perfect. I am looking forward to taking a team back again very soon." "Thanks for the help with arranging our trip this summer. Without your help the trip wouldn't have been the same. Because of you our girls' U17 team was able to play the quality matches they wanted in both Munich and Berlin. Not only did our girls play some great matches, but also were able to experience the great culture and beauty of Germany, Austria, and the Czech Republic. I will definitely be recommending your services to other coaches in Western Colorado. If their kids can experience the same fun and well-organized sports tour that you provide, then they will have the same great memories that our kids have today. Thanks again. "I always love what Daniel is able to provide for us. Everything, from the hotel facilities to the training facilities, to the competition, to the sightseeing - unbelievable!" "Thank you, Daniel, for exchanging your sophisticated soccer mind with me on a regular basis. Our discussions are pure fun. Your soccer knowledge has been a great asset to me in the development of my players. Sports Travel Agency definitely supplies US teams with the best possible experiences during tours." "I cannot imagine a better trip than Sports Travel Agency's Bavaria tour. Daniel is fantastic when it comes to choosing the right places and opponents and he knows what a College Coach is looking for." "Soccer - if that's your life, you gotta go to Germany with Sports Travel Agency. You learn so much more of the game that you had no idea was possible."